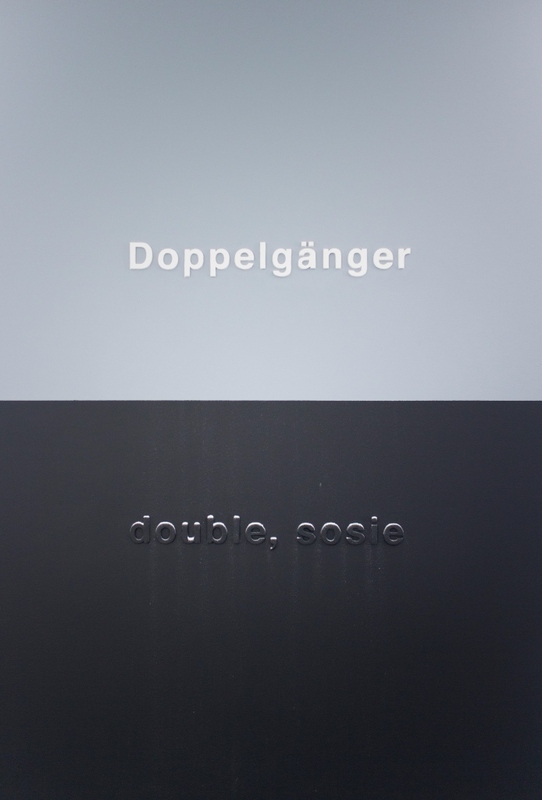 Carl Trahan: Doppelgänger (2008). Paint, plaster. Image courtesy the artist. Haegue Yang: Three Kinds in Transition (2008). 235 images, 30-inch Apple Cinema Display on loop, 21.5 x 27 inches. Photographs by Gunter Lepkowski. Courtesy of the artist and Galerie Wien Lukatsch, Berlin. 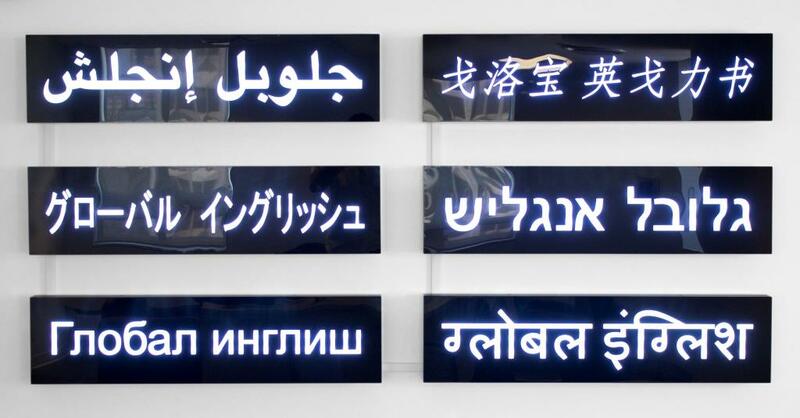 James Clar: Global English (2011). Six illuminated signs, 43.5 x 12 x 4 inches each. Image courtesy of the artist. Nicoline van Harskamp: The New Latin (2010). DVD video, 30 minutes and 23 seconds. Image courtesy of the artist. Simon Glass: On the Tower of Babel (detail, 2013). Vinyl lettering with letterpress chases. Image courtesy the artist. If there is something to take away from Coming to Terms, it is that an exhibition about finding intrinsic value in cultural difference can be cleverly punctuated by its unusual and thoughtful choice of exhibition space. Curated by independent Toronto- and Regina-based curator John G. Hampton, Coming to Terms is a nuanced and sensitive take on the subjectivity that accompanies language. The exhibition traced thematically the trajectory of “International Art English” by Alex Rule and David Levine, an essay on international language use in the context of art writing commissioned by Triple Canopy in 2012, and arguably the most viral and viable piece of art writing that year online. As an exploration of multiplicity in languages, Coming to Terms challenges the hierarchical ideas presented in IAE with a more subtle look at the gaps between language; or what can be somewhat summarized as translation. 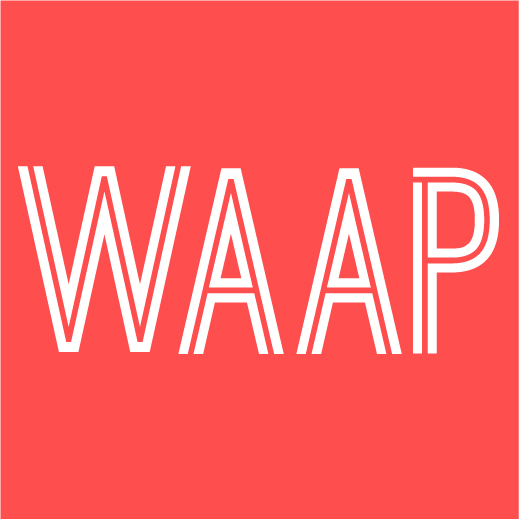 Indeed, in the piece of writing accompanying this show, the curator states that the exhibition is structured around three overlapping themes: deconstructionist translation; hegemonic anglophonization and its effects; and intersemiotic translation. Hampton continually references the focus translation as a starting point for the emergence of meanings that complicate and resolve language. Referencing intuition in translation cast an interesting light on the naturalistic, human forces that insert themselves into the academic realm, emphasizing the fact that accurate translation requires a genuine cultural understanding and a certain amount of empathic intuition. There is something touching about the inclusion of the term intuitive, an adjective that nods towards studio practices and art making. Although this is not the first document to make an analogy of artistic practice and linguistic translation, Hampton makes a curious reference to the use of this meta-process by foreign (or, rather not English-based) artists who look for the gaps in translation to create more space for free-range meaning and come to terms with the differences. An interesting departure point from one of the more prevalent works in the exhibition: On the Tower of Babel by Simon Glass is a text from the Bible, perhaps the most mistranslated document of all time, or, maybe, the document whose rampant paradoxical misinterpretation has been most consequential. 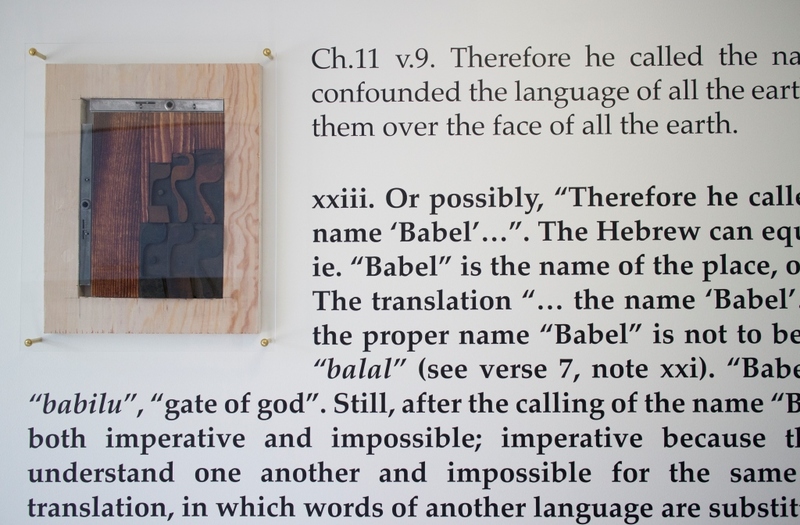 Glass uses a questionable decision by a translator to insert the word confusion after the name Babel, launching into a spiraling study of biblical passages in the story of Babel in six installments on the walls of the Institute. 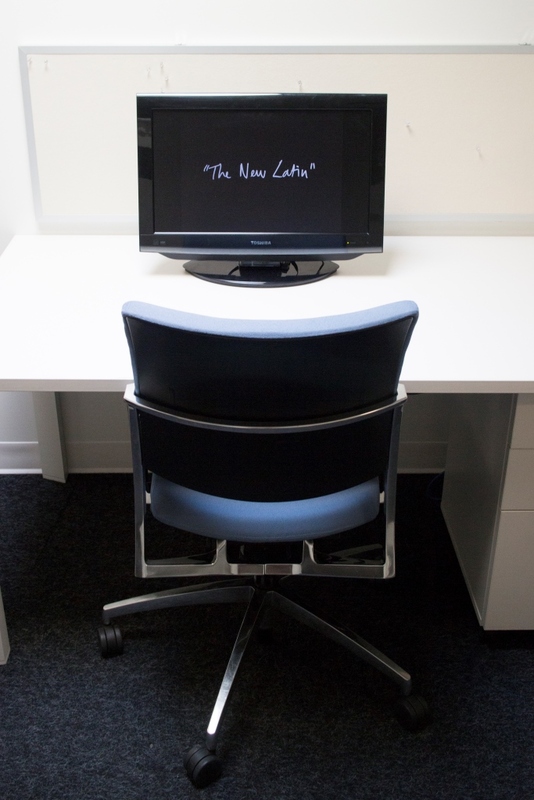 Another highlight is Nicoline Van Harskamp’s highly convincing video work The New Latin (2010), which depicts a public conversation between the artist and Alexandru Dima on the subject of “expressive power in contemporary cultural production”. The two had memorized the discussion in Romanian phonetically and are performing as speakers in front of a seated crowd. The subject of the conversation, syntax and dialect, is as prevalent to the conversation as its medium. 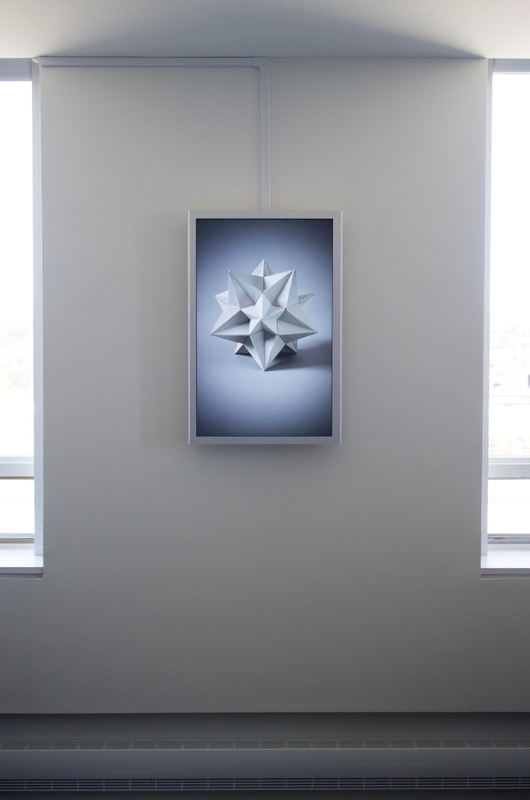 Some of the other works such as Haegue Yang’s Three Kinds in Transition (2008) video and Thea Jones’s Restitching III (2010) elaborate on the intuitive, chain-reaction aspect of linguistic intricacy and its connection to practice. The fruitlessness of cultural expressions and linguistic forms highlights a wide and fruitful model of miscommunication emerging in the visual art field in conjunction with the globalization of the art market, where the medium is charmingly obtuse and, therefore, inherently political. To face this statement is to face the challenges we observe as makers of culture and the monolith presented to us by North American culture. Xenia Benivolski is a writer and curator currently based in Toronto, where she co-runs the 811 gallery and the NoYo AIR program.